Today, December 5, 2018, Apple released iOS 12.1.1 and usually ‘point’ releases aren’t news. This release is ‘news’ for Flow Kiosk and other users of the iPad as a kiosk or in ‘kiosk mode’. 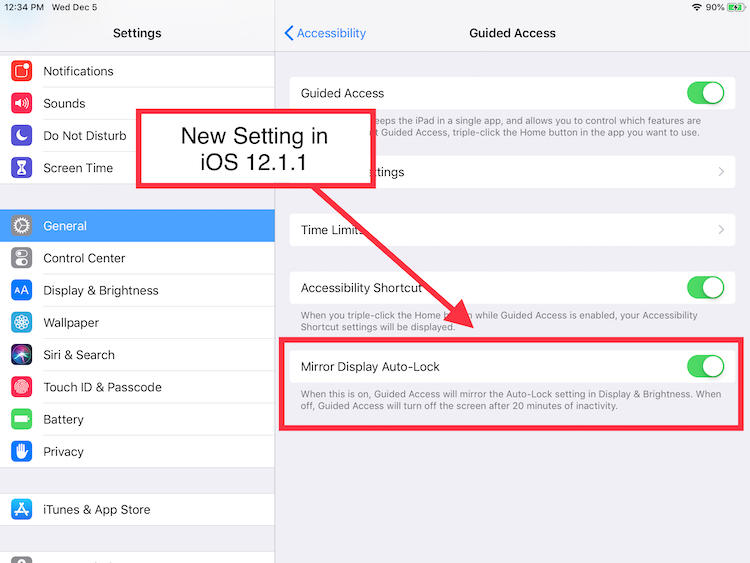 iOS 12.1.1 is actually a very important release because guided access is fixed with a new setting. With the release of iOS 12.0, Apple introduced a feature/bug. This bug caused iPads’ screens to go to black after 20 minutes when in Guided Access mode. This was meant to be a feature for some users, but it inadvertently caused our users and other iPad kiosk users a lot of pain. We found a temporary solution for our users back in October, but the ‘real’ solution was just released today. Apple created a new setting in the Settings app under Guided Access. This setting ‘mirrors’ the setting under Display & Brightness, so when you set that to ‘Never’, the screen will never go black. So, guided access fixed with new setting. Here is a video that walks through this setting along with the Display & Brightness setting. If you have any questions please contact us or leave us a comment below. We are so thankful for all our new and current users. In just over 3 months, we have worked with dozens of big and small companies. We will be doing another case study soon on one of our new customers. To download Flow Kiosk, go here. If you need any help or have any questions, please feel free to reach to us via email or via our web chat.